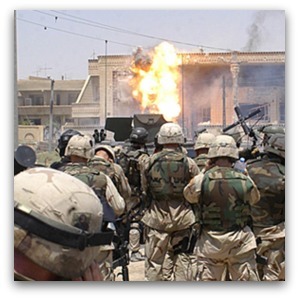 Ten years after the first bombs fell on Iraq, three facts seem indisputable. First, the reasons given by the leaders of the USA, Britain and Australia to justify the war were inadequate. Second, thousands died in the conflict, many of them civilians, including children. Third, the perpetrators have largely escaped any form of accounting. The leaders of the countries that headed the 'coalition of the willing' pleaded that they did not have the wisdom of hindsight. This is either self-delusion or more of the propaganda that suggests their way was the only way. Supporters of the war misleadingly argued that the situation in Iraq demanded that the West do something. The West was already acting by contributing to United Nations sanctions and weapons inspections. Military action is always an imperfect solution and must be envisaged as a last resort, not as the most convenient one. During the Cold War years governments predicated foreign policy on the existence of external threats. The fear generated by the image of an aggressive alien power helped to control domestic populations and justify large defence expenditures. A new interpretation of this external threat was cast following the 9-11 terrorist bombing. Genuine leadership by those determined to act might have won popular support — more direct approaches could have been tried by high level delegations. Even had the three countries provided incentives of the type lauded in free market capitalist rhetoric, change might have been effected peacefully. Although public support for the invasion was initially low, many Australians changed their attitudes once troops were committed. Patriotism follows military commitment, perhaps because the Anzac myth is so deeply ingrained in our national identity. No one wants our defence personnel to feel unappreciated. Unfortunately, support for the long term commitment to Afghanistan has segued into acceptance of foreign weapons of war in our north. Our supposed role as 'deputy sheriff' of the region smacks of little more than a meek acquiescence in vigilantism. We in the West speak about promoting democracy abroad but have a poor record in our ability to distinguish between dictatorships and popular governments. The pejorative term has changed from 'communist puppet regime' to 'rogue states', but the arrogance remains the same. Unless 'democracy' is to degenerate into an empty term of approval, we must think hard about issues of responsibility, accountability, openness and civil rights. Shooting first and asking questions later offends these ideals in the international sphere, just as it does at home. Domestically, we pay a high price for our readiness to follow great powers. The lives of defence personnel are endangered, overseas deployments are costly, and active participation in the arms race damages our ability to contribute to multilateral peace processes. These costs place strains on the overseas aid projects so necessary to promoting future security. How different it would be if the planes using the northern airfields were not part of the world's greatest arsenal of 'weapons of mass destruction', but carriers on their way to humanitarian relief programs in Africa, for example. The contradictions of the Iraq invasion continue. As Donna Mulhearn notes in her memoir Ordinary Courage, Australia may have imprisoned without trial more Iraqis than were deprived of their liberty during the dictatorship overthrown by the war. For her conscientious decision to become a human shield to protect civilian facilities during the bombing, Mulhearn was vilified at home. Patriotism reduces complex questions to simple slogans, and any challenge to the cycle of military response requires a degree of imagination that frightens the unthinking, and a degree of risk that terrifies people whose fears governments have augmented for their own cynical purposes. We still hear arguments that on balance the war improved the lives of the people of Iraq. Such attempts to reduce the lives lost in Iraq to figures on a balance sheet are immoral. The principle that 'might is right' is now embedded in the national consciousness. As disparity in wealth increases and an underclass mentality takes hold, the ideals of equity and justice seem like distant echoes of a time when Australians believed everyone deserved a fair go. It is not surprising that despite engaging in costly military actions over a decade Australians are more fearful now than we were in 2003. Tony Smith holds a PhD in political science. He has taught at several universities including the University of Sydney. Recent articles by Tony Smith. A clear, concise and compelling analysis. Greatly appreciated. There is a wonderful, brief article from The Times, reprinted in today's 19/3/13 Australian (World p.11) "Intelligence on Iraqi WMDs'total fiction'". Apparently the German Intelligence people had totally discounted the reliability of Rafed al-Janabi, a refugee there and the source of the CIA's "intelligence" on this matter. Iraq has had a long, sad history under the Turks and British. We need to tread gently in the Middle East. An excellent article ,Tony. Will we ever learn? One small benefit for Australia from these unnecessary and unwise wars is we do receive some lovely immigrants although I am positive that is not the intended result. Grateful thanks, Dr. Smith. The degradation of Australian mores, concerns, caring, acceptance is deep and seemingly will remain so for the future; until we become a country where everyone is coffee-coloured and seen as "we" and "us". The greatest danger to peace, justice,harmony, and the "fair-go" ideal, is the ingrained "us and them" mentality. In this regard, Religion should be giving an inspirational lead. Instead, it is one of the main contributors of the spirit of division. It is time for a Theist's Manifesto:- "Religions of the World, unite. You have nothing to lose but your delusions". But much to gain:PEACE AND lOVE. 1. Fact: God treats every person, community, and nation, personally, as 'special'. DELUSION: "We (whoever we are) alone are special, and all others are inferior". 2. Fact. God is calling every person, community and nation to start from where they are, with what ever degree of intellectual or cultural development they have achieved so far. DELUSION:'Others' have to adopt our way of doing things before they become "acceptable" WE NEED TO BEGIN TO CO-OPERATE WITH 'OTHERS', like the limbs and organs of the human body, which all play very different parts for the good of the whole. The unity and harmony we need is not uniformity but co-operation. To achieve this we need to down-play the things that divide us,(which we usually hold most dearly), and upgrade the things that we have in common. "Although public support for the invasion was initially low, many Australians changed their attitudes once troops were committed. Patriotism follows military commitment, perhaps because the Anzac myth is so deeply ingrained in our national identity. No one wants our defence personnel to feel unappreciated." Says so much about our lack of moral courage and dependency on the USA. You know if Gillard wanted to do something useful between now and September she could hold an inquiry into why we went to war in Iraq and the Australian Wheat Board's trade with Iraq, after all other nations have inquired similarly. But thanks Tony for a wonderful and clear article. We cannot support the needy and the military. But it was good for the election cycle! This Iraq foray and the disgraceful one in to Afghanistan, plus I suspect the unseemly haste with which the generals of Burma are being praised for wearing civilian clothes, added to which could go our grovelling towards Indonesia during the murderer Suharto's regime are all about elevating the stocks of our so-called leaders. Of course, it helps that they all also fit into the US foreign policy objectives. Looking ahead will be a futile war against China, either directly or in some form of proxy activity, which also is doomed to failure. Perhaps when Japan has a fit and announces its attack on China and we are 'forced' to choose sides. Meanwhile, the nation of Pakistan goes unquestioned for its aggression and then there is Israel, perhaps our darkest and most disgraceful support continues to help prop up this real rogue state, that has absolutely no intention of changing ever. Again, all in aid of supporting the US foreign policy, which seems to be in tatters these days, with every foolish foray into state intervention they make, along with the UK now. Poet Philip Larkin wrote about war: "A 'war' poet is not one who chooses to commemorate or celebrate a war but one who reacts against having a war thrust upon him." Australia's engagement in the wars in Iraq and Afghanistan, agreed to mainly to support our alliance with the US, has led, as all wars do, to shocking loss of life - for both 'sides'. Swapping the sword for the ploughshare - good idea. The reasons given for the invasion of Iraq seemed "inadequate" - surely a diplomatic euphemism - even before the United States launched the first bombs and missiles. Kyrie eleison! A good article. Thanks to ES for addressing this important subject. For those who want further information on why and how John Howard took Australia into war in Iraq on 18 March 2003, without consultation with Parliament or people,and what we did in that war, look at sources on the CIWI website http://iraqwarinquiry.org.au/. This is not just academic history. It could all happen again, under a Labor or Coalition government, in alliance with the US in an attack on Iran. We could take part in the destruction of that country,with huge suffering to its people, as we helped to destroy Iraq. Both major parties have declined to pursue a public inquiry into Australia's role in the Iraq War. Both major parties want the freedom to do it all again if our US ally calls on us. Street demonstrations did not stop Australia's entry into the Iraq War - our rulers ignored 'the mob' then, and would ignore it again. CIWI, the Campaign for an Iraq War Inquiry, has been set up to mobilise political concern now that Australia might learn the important lessons for the future of our role in the Iraq War. CIWI has an eminent and wide-ranging list of founder members. I agree with Tony Smith. Even at the time, the "Willing" talked themselves into believing in their own rhetoric that Saddam did have WMD's, even though the evidence they used to justify their view was most unconvincing. There were even UN inspectors on the ground in Iraq who could not find any WMD's. Now, ten years later many Iraqis are saying they are no better off than they were before the war started. Australia seems incapable, through its governments, to take an independent stand on the important issue of whether we should go to war in support of the USA, even when the war is not justifiable on the grounds the USA relies. Surely we need to take a good look at our alliance with the USA and decide that we will make up our own minds on whether we will commit Australian lives in the cause of a war which has no possibility of being a threat to our country. GW Bush, John Howard and Tony Blair should all be had up before the European Court of Human Rights, for crimes against humanity. I know Bush and Howard can't, because we are not members of the European judicial arrangement. Blair should have been charged, but has not. Why? The three of them, plus Cheney, Rumsfeldt etc, are an absolute disgrace, bringing shame upon the Western World. It makes me feel ashamed to be Australian. Iraq was the first war in history to be declared unjust by the people and by almost all Christian leaders in the West before it had started. One poll found that 90 per cent of Australians opposed the war without UN authorisation. Yet under John Howard's leadership we went to war anyway. Where did the anti-war movement go wrong?